In his career as an organizational consultant, relationship counselor, and hostage-negotiation trainer, Mark Goulston has found what works, consistently, to reach all kinds of people in any type of situation. : How to Deal with the Irrational and Impossible People in Your Life is his latest book, published by AMACOM (October 2015). 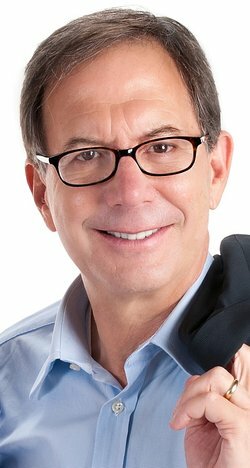 Mark blogs or contributes to Harvard Business Review, Fast Company, and Business Insider, and writes the “Closing Bell” for C-Suite Quarterly magazine and the Tribune syndicated column, “Solve Anything with Dr. Mark.” He lives in Los Angeles, California. Morris: When and why did you decide to write Talking to Crazy? Goulston: I think the main revelation was the power of leaning into people’s irrationality as a way to calm them down and bring them back to their senses. Imagine an irrational and agitated person as car engine that is racing past the redline. You can try to stop it by stepping on the brakes or instead you can calmly pull over to the side of the road and turn the engine off. Leaning into people’s irrationality is like the latter. Goulston: I was hoping that I could use a similar form and structure that worked so well in “Just Listen” with stories that people could identify with combined with counterintuitive insights, strategies and tactics that most people could use that would work. However at the beginning I didn’t know if this book would flow and nearly write itself the same way as “Just Listen.” It was a pleasant and an immense relief when that was exactly what happened. Morris: You suggest a number of ways to “deal with the irrational and impossible people” in one’s life. Aren’t we all — or at least don’t we all seem to others — somewhat “irrational and impossible” from time to time? Please explain. Goulston: Absolutely. I do however make a distinction between “irrational” and “non-rational.” From time to time, we are all non-rational. By that I mean that we are all thinking and responding to a new situation in a manner that fit a prior situation, but not the present one. When we do that we are being non-rational. Irrational on the other hand is when we are more rigid about how we are thinking and more pushy in how we react with regard to a situation and then want to force others to agree and conform to our POV. Morris: What exactly do you mean by “everyday craziness”? Goulston: By “everyday craziness” I mean the frequent interactions between others and us where people are frustrating and exasperating us. I make a distinction between that and mental illness. I see “crazy” and mentally ill as different. To me, mentally ill means having a mental disorder that if untreated causes a person to not be able to act differently and will continue until that mental illness is effectively treated. Crazy occurs when people are capable of controlling their behavior, but choose not to. Morris: When you refer to “handling” everyday craziness, do you in fact mean “defusing” it? Please explain. Goulston: I like that term “defusing” in the movie thriller sense of the word. That is what you see in some action films where the hero or his/her team must go in and defuse a bomb before it explodes (usually with seconds to spare). Rather than trying to contain or counter “crazy” behavior, the book teaches you how to understand an irrational person’s modus operandi, then “lean into” it and defuse it before it escalates or explodes into crazy making behavior? Morris: How do you “lean into the crazy”? Why do it? Are there times when it best be done? Goulston: By leaning into crazy you are not just allowing the person to verbally vent or whine or complain, you are inviting them to. What’s more you are inviting them to go even deeper into what they’re talking about. By doing this instead of taking issue with them or becoming defensive, you’re enabling them to get more off their chest and out into the air where it can do no harm to them or you. The best times to do it are with people who are stressing you out, causing you to have a pit in your stomach at just the mention of their name and causing you to avoid them. By learning to lean into them, help them get stuff of their chest and calm down, you’re developing a sense of mastery about something that has always caused you stress. 6. Move the person to a sane place where after you have been able to help them calm down, you’re able to work with them to getting them to a more rational and realistic point of view. Goulston: I am an empirical neuroscientist and neurotheorist. That means I like to find neuroscience based explanations for what might be going on in people’s minds and behavior and my research is based on my observations from nearly 40 years of clinical and professional practice. By triangle/silo/triangle I am speaking about a concept I introduced in this book called Triunal Rigidity. Triune refers to a functional model of the brain first postulated by neuroscientist Paul McLean where our brain is functionally and to a certain extent anatomically comprised of an evolutionarily recent upper human rational brain on top of an older middle mammalian emotional brain on top of a primitive lower reptilian “fight or flight” brain. In my view, people act in a characteristic and crazy making way because their three (triune) becomes locked together rigidly that is also rigidly connected to a view of the world that they resist changing. This is the actual neuroscientific explanation for the “definition of insanity being doing the same thing over and over and expecting the same results” (i.e. that it will continue to work even though the situation you are facing has changed). It also explains why it is so difficult to impact an extremist mind and change it. The triangle/silo/triangle refers to the fact that the more rigid our three brains are with our emotions and fight or flight brains taking charge the more we will act the same way and try to make the world conform to our view, because we are not able to adapt to it when it changes. The triangles refer to the alignment of the three brains and the silo refers to the fact that when our three brains are rigidly wired together and a particular outcome the more we are functioning similarly to the way a silo in a company functions, namely the less they are able to cooperate with other silos. Morris: What does the “Eight-Step Pause” help to accomplish? Goulston: The eight-step pause enables you to walk yourself up from your most primitive reactivity up into your rational brain where you can then make logical decisions based on the situation you are facing instead of reacting impulsively. Morris: You identify and discuss 14 tactics for “talking to crazy.” Which seem to be most effective? Why? There are two that I find to be most effective. The first is the Belly Roll which is about using assertive submission to take the steam out of an attacker by in essence baring your neck instead of your teeth. When you bare your neck and show that you are not a threat to the other person, they will often calm down. Why? Because much of the time people are in an attack mode is because underneath they’re feeling threatened. When you show your vulnerability it takes away their fear that you’re going to attack them, which often causes them to relax. The triangle/silo/triangle refers to the fact that the more rigid our three brains are with our emotions and fight or flight brains taking charge the more we will act the same way and try to make the world conform to our view, because we are not able to adapt to it when it changes. The triangles refer to the alignment of the three brains and the silo refers to the fact that when our three brains are rigidly wired together and to a particular outcome the more we are functioning similarly to the way a silo in a company functions, namely the less they are able to cooperate with other silos. The second is Time Travel. With this tactic you focus on the future that nobody has messed up yet. This works because very often when you and another person are having a conversation about something that has happened it can quickly deteriorate into mutual defensiveness or he said/she said escalation after the fact. Using this tactic, you essentially take the focus off of you and the other person remaining stuck in the problem and move onto a solution in the future. You do that by saying to the other person something like: “Going forward in order to prevent this situation from occurring again what positive things must I consistently do and what negative things must I completely stop?” And after they tell you what those are you say: “This is much too important for me to have gotten it wrong. So what positive things you said I must consistently do are __________ and what negative things I must stop completely are ____________. Is that correct?” Repeating what they said back to them under the notion that it is important helps them feel important, but also causes them to have to listen to you. Both of these have a calming effect. After you ave repeated what they said back to them, wait for them to give you a confirmatory, “Yes,.” Their saying, “Yes”to you will increase their commitment to doing things differently in the future. Morris: Which of these tactics seems to be the most difficult to master? Why? Goulston: Frenemies which is where you compliment someone who is undermining you and making you look bad to someone else to make themselves look better. The reason to do that is because people who are insecure and trying to hide a flaw or area of incompetence will often resort to making someone else look bad to keep a boss from discovering their deficits. If you work to help such a person identify an actual skill or value they have and then compliment them to someone else, it may take away their need to throw you under the bus. This is one of the most difficult tactics because the thought of helping such a duplicitous person who means you ill will make you want to gag. Morris: As I read and then twice-re-read your brilliant book, I was again reminded of how important preventive maintenance is to reducing (if not eliminating) “crazy” behavior in the workplace. What specifically can senior-level executives do to prevent minor incidents of such behavior from becoming major workplace crises? Goulston: The more a senior level executive stands for something such as the integrity of everyone doing what they say they’ll do when they say they’ll do it, the more respected he or she will be. The more respected they are, the better people will behave because they will not want to disappoint such a person. One of the ways to grow into this person if you’re not there now is to declare what you stand for, what you will stand up for and what you won’t stand for. And I mean “declare” instead of “explain.” When you declare something people know what matters to you and they’ll respect you more. When you explain it, that sounds weaker. It was the Declaration of Independence, not the Explanation of Independence. Morris: What are the most important dos and don’ts to keep in mind when attempting to talk to crazy not only in the workplace but anywhere else? Goulston: The saying “where there’s a will there is a way” is not as true as “where there’s a way there’s a will.” When you discover a “way” to approach a situation that is doable by you (vs. having to be an expert psychologist or psychiatrist) you will find the will to do it. The more you understand what is going on below the surface of “crazy making” situation and the more you can take steps to deal with it, the more you will. My hope is that Talking to Crazy will be a source of both understanding and doable by you tactics that you can use to deal with the irrational and impossible people in your life. Morris: As you think of your book, what comes to mind as key points that you believe will most benefit CEO’s and business owners? o First, “Replacing Fight-or-Flight with the Sanity Cycle” (Page 7): The six steps enable you to understand the “method to other people’s maddening behavior” and then take control of situations that cause you to feel out of control. o “Three Pathways to Crazy…and One to Sane” (Page 14): By understanding how being coddled or coddling; being criticized or criticizing; being ignored or ignoring; being supported or supporting can affect other people’s personalities and your own, you can turn things around by finding those people who want to support you or people you could support. The charts on p. 16 and 19 often cause people to understand their and other people’s personalities in ways that can be life changing. o “Nine Most Common M.O’s of Irrational People” (Pages 26-28): This chart describes the modus operandi of the most common irrational people you’ll run into and your reaction to them. Becoming aware of both will help you not feel so blindsided when they act up and to make a commitment to improve how you deal with them. o “The FUDCRUD Test” (Page 39): This is a way to tell if you’re dealing with a blamer/complainer vs. someone who takes responsibility for their decisions and actions by having them tell you about something that Frustrated, Upset and Disappointed them from their prior job and company. o “Identifying Your Worldview” (Pages 52-54): This exercise will help you identify and then correct how you look at the world. It will greatly affect the way you feel about it and your life. o “The ‘Oh F#@& to OK’ Speed Drill” (Pages 68-69): How to talk yourself from upset to calm by going through each of these steps in your mind. o “The A-E-U Technique”(Page 85): When you Apologize for something you did (or failed to do), Empathize with how that made another person feel and Uncover what it caused them to feel towards you, it can be very disarming. o “Time Travel” (Page 93): Focusing on the future before anyone has messed up and then a way to either prevent or deal with something when it does go wrong is much more effective than getting embroiled in finger pointing and blaming after the fact. o “Digging Down to Disappointment”(Page 107): The disarming and diffusing power of eliciting what someone is truly disappointed about underneath their overt behavior is truly amazing. o “The Fishbowl”(Page 114): Having other people look into each other eyes and keep talking until they express what they’re feeling underneath their outward hostile reactions can help them mend a conflict on the spot. o “The Butter-Up”(Page 132): How to disarm a know-it-all. o “The Kiss-Off (and the Gentle Kiss-Off)” (Page 147): How to stop a manipulator before he or she pushes you into guilt, resentment and anger. o “I Know What You’re Hiding”(Page 159): Just like you can’t be a little pregnant, you can’t be a little sociopathic. Inside most sociopaths is a fear of having a long list of things being exposed that they thought they’d successfully hidden. Use this insight and the described tactics to extricate yourself from them. o “You’ve Lost That Lovin’ Feeling”(Page 168-173): An approach for couples to rise above the endless “he said/she said” squabble to build with each other a relationship beyond whatever each thought was possible. o “Shock Absorber”(Page 175): Rather than taking a partner’s emotional outburst as personal, realize they may just be needing you to help them get stuff off their chest verbally before it builds up and causes them to do something they’re really regret. That can often help them come back to their senses so they can have a rational conversation with you. o “Copy Cat”(Page 180): Help a partner or co-worker put into words what they’re most frustrated about, but can’t express may be the “high colonic” they need to exhale, relax and come out of being shutdown and sullen and into a conversation with you. o “Child A or Child B”(Pages 184-185): Identifying what you want your child to look and behave like at age 18 and then having that dictate the strategy you and your partner follow to make it happen. o “What’s the Worst Thing for You?”(Page 189): A strategy you can use that I used with a group of teenagers ages 11-17 in a homeless shelter to help them express themselves, connect with each other and perhaps have one of the best conversations they’ll ever have with their mothers. o “The Assumptive Close” (Page 199): How to short circuit and bypass a conversation that would otherwise turn into a never ending barrage of complaining and negativity. “The Four H’s and Four R’s”(Pages 204-207): An airtight formula for earning back trust and forgiveness after you have deeply hurt, disappointed or deceived someone. Alternatively you can use it to tell someone who has hurt, disappointed or deceived you what they need to do to earn back your trust and forgiveness. o “When someone is mentally ill” (Pages 213-225): Elucidates the various levels of help that laymen may not be aware of from: Medically Oriented Psychiatry to Psychotherapy to Psychosocial Rehabilitation to Counseling to Mentoring. o A letter from a suicidal teenage child that you might want to share with one of your own that you’re worried about (or a suicidal teenager might share with a parent) (Page 242-243). Use it to begin a long overdue and maybe even life-saving conversation. o A conversational example of talking a young adult out of his violent thoughts (Pages 247-249). Morris: For more than 25 years, it has been my great pleasure as well as privilege to work closely with the owner/CEOs of hundreds of small companies, those with $20-million or less in annual sales. In your opinion, of all the material you provide in Talking to Crazy, which do you think will be of greatest value to leaders in small companies? Please explain. Goulston: I think the Sanity Cycle is perhaps the best guide to use to help owner/CEO’s to realize that there is a process you can follow that can help you deal more effectively with irrational people. If they memorize it and practice using it as a guide, it will become more automatic and they will find themselves calmer and more in control of situations that now frustrate them. My response: Often the respect that other people and you have for yourself rises and falls on how you deal with irrational and difficult people since avoiding them completely is not possible. The more you become provoked by them or try to avoid them, the less people and you will respect you. Perhaps the greatest benefit is that mastering these skills will lessen stress and prevent burnout? Why? Most stress is caused by keeping a lid on what you’d like to do back to someone who is behaving irrational or impossible. Burnout occurs when without these skills, there is a cumulative build up of all the ways you’d life to retaliate to the cumulative build of bad behavior of others that you are not dealing with. Another terrific benefit in knowing how to deal with the irrational and impossible people is developing the ability to be unflappable in most situations. Why is that important? We’ve all been witness to many political candidates losing a primary or general election by not being that way. And just like them, that is something you would like to avoid if you could. Bob, I am indeed on a personal journey and mission. It’s called Healing the World, One Conversation at a Time. My book Just Listen is about learning to listen into people in a way that causes them to open up. Real Influence, co-authored with Dr. John Ullmen, is about going from ‘your here’ (i.e. where you’re at) to ‘their there’ (i.e. where they’re at) so you can have more influence with them. Talking to Crazy is about leaning into irrational behavior that people use, usually to protect themselves from a world they don’t trust in a way that causes them to feel safe in order to help them calm down and listen to reason. I think that now more than ever, people are technologically connected, but they’re not relating to each other. To me a world where people don’t relate to each other is one in which they care less and less about each other and it’s a dangerous one. Caring less about others leads to impatience which can quickly lead to intolerance which can quickly lead to anger and then violence. I believe more people are talking at or over each other than they are talking to or with each other. Talking with each other is the language of relating and if every day, every person would have at least one conversation where they talked with another person, the world as we know it would change for the better. Morris: Thank you. Mark, for this latest interview. Of all the more than 450 others that I have conducted thus far, I cannot recall another that surpasses it in terms of quality and value of content as well as clarity and eloquence when presenting it. Bravo!